Click on the ticket icon to your right for all available ticket types. General admission tickets give you access to all 3 entertainment stages, beer gardens (if you are 21+), and the opportunity to shop, eat and experience Southern California Latino culture! Discounts for Seniors, Military, Students! If you are a student aged 13 +, a senior aged 55+, active military or a veteran, then general admission is only $10! VIP Tickets give you easy entry via a dedicated line, a Festival tote bag, and access to the VIP Tamale Tasting Room where you will taste tamales in a restaurant style setting. As you enjoy tasting tamales in the air conditioned Dale’s Center Banquet Room you will also have the opportunity to vote in the Festival’s BEST Tamale competition. VIP tickets also allow you access to indoor restroom facilities. 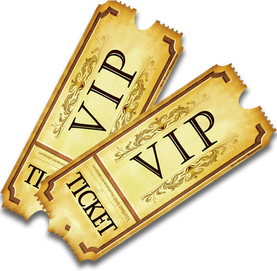 VIP tickets allow you full ACCESS to the Festival and the VIP Tasting Room. From 11 a.m. – 7 p.m.
Do you want all of the latest information about the upcoming Riverside Tamale Festival? Sign up here to receive regular updates.